Emilia Romagna produces 70% of all pears produced in Europe. The pear has a yellow-green skin with russeting around the stalk. The pear is juicy, sweet and aromatic, it lends itself to many different food and wine combinations. This fruit can be eaten fresh and is paired well with various types of cheese and wine. Pears are also an important source of fiber, potassium, Vitamin C and essential for strengthening the immune system. The Zeri bean has several varieties, including the best known, the "bean with an apron." It is small, round and has a black and white color. It is characterized by a small plant between the kidney bean and the creeper, of slightly flat shape and small size. Sowing takes place between April and July. The bean does not require a lot of water during its growing time and is harvested from late July until October. The ripe pod is a straw yellow color and contains 6 to 7 beans. The sowing time is in May and the harvest is at the end of July. According to the local tradition, the beans must be kept in containers with pepper and laurel. They are typically used as dry legumes and eaten as a side dish. The Bigliolo bean has a thin skin and sweet taste with a mealy texture. The shape of the pod may be either straight or slightly curved with dimensions of 3 to 4 inches. The seed has a pale white color that is lightly striped with red. It is produced in the months of June and July. The seed is kept from year to year and is reproduced by the same companies, so that over time it has retained a wealth of biodiversity. It is used in soups and boiled to bring out the natural flavor. Potato Zeri has a round shape and three different color varieties: reddish white, white and pale yellow. Each of the potatoes have different uses. The reddish one is suitable for longer cooking, the white is suitable for frying and the pale yellow is excellent for baking in the oven and boiling. The cultivation of the potato Zeri dates back to 1777, introduced in Pontremoli by Biagio Grilli of Adelano. Today it is grown at a high altitude between 1,640 and 4,920 feet. The apple is medium in size and has an elongated shape. The skin is thick, smooth, and has a yellow-green color with bright red streaks. The interior color is white with a sour flavor. The apple is known for being crisp and not very juicy. It is traditionally harvested in October and preserved until the following spring. This apple is suitable for fresh consumption and cooking. It owes its name to the shape that resembles that of the ox muzzle. The wheel apple is round and is not as large as other apples from this region. The color is green with streaks of red and yellow. When ripe, the fruit has a strong fragrance and semi-sweet flavor. The texture is firm and on the inside there the pulp is white. The apples are harvested during the second half of October, and the average annual production is about 220 tons. The apples are consumed fresh or used to make desserts. Casciana apples are rounded and pressed shaped When ripe the apple is red with green-yellow streaks. The fruit is highly scented with a sweet, slightly sour flavour and medium to small in size. The Binotto apple is small and round with an intense red color. The flavor and aroma is reminiscent of the rose. It is harvested from wild plants of the area. The quality and traditional character of the product are given by the particularities of the cultivar when the fruit grows wild in the mountain meadows of Lunigiana and the province of Massa-Carrara. The Pear Ruse is typical of the municipality of Zeri. It is yellow with red spots and small and round in size. The flesh is hard and the taste is bitter. The pears are picked in the fall and are suitable to be stored for long periods of time if kept in a cool, dark and dry location. The pear is consumed exclusively when cooked with the addition of wine, sugar or honey. The Ripola onion is round and flat. It has a faded rosey color. The onion is sweeter in taste compared to other onions. The production cycle is from June to July and October to November.The traditional characteristics of the Ripola onion are due to the peculiarities of the cultivar, which has been influenced by climatic conditions. The climate gives it a less pungent smell and a richer taste. Growing the onion at a lower altitude, however, will increase its bitterness. Typically the onion is consumed fresh and in salads. 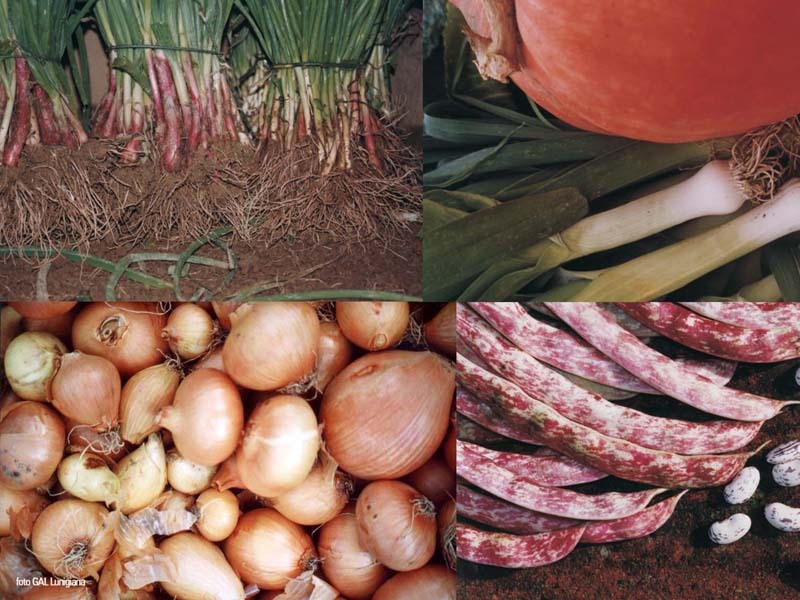 The Terceretoli onion is pink and has a round, flat shape with an average size of a 1 pound. Unlike other onions, the Tercereoli does not have a very strong taste. The flavor is delicate with a crunchy texture. It is harvested in June and July. The climate and soil before this time give the onion a particularly sweet taste. It is consumed raw, in salads and in vinaigrettes. This product does not have a long shelf life. The Bassone onion has a red exterior with a white interior. It is produced in the months of November and December. Its sweet taste makes it possible to consume it raw, with vinaigrette, oil and salt. The onion can also be used as an ingredient in desserts, such as Barbotla, or in a pie cooked with roasted onions. It pairs very well with local red wines.